The original Heavenly Bodies team consisted of Don and Al Green managed by hated English manager Sir Dudley Clements. Fall 1985: Another version of the Heavenly Bodies existed in Memphis including Tom Prichard and Pat Rose managed by Sherri Martel. The Heavenly Bodies team consisted of Tom Pritchard and Stan Lane. April 11, 1992 – SMW TV: The Heavenly Bodies (Stan Lane & Tom Prichard) defeated The Batten Twins (Bart Batten & Brad Batten) in the 1st round. April 25, 1992 – SMW TV: The Heavenly Bodies (Stan Lane & Tom Prichard) defeated Danny Davis & Joey Maggs. May 2, 1992 – SMW TV: The Heavenly Bodies (Stan Lane & Tom Prichard) defeated Danny Davis & Joey Maggs in the semi-finals. May 9, 1992 – SMW TV: The Heavenly Bodies (Stan Lane & Tom Prichard) defeated The Fantastics (Bobby Fulton & Jackie Fulton) to win the tournament and vacant tag team titles. May 22, 1992 – SMW: The Heavenly Bodies (Stan Lane & Tom Prichard) defeated Davey Rich & Johnny Rich to retain the tag titles. June 13, 1992 – SMW TV: The Heavenly Bodies (Stan Lane & Tom Prichard) defeated Ben Jordan & Joey Maggs. June 20, 1992 – SMW TV: The Heavenly Bodies (Stan Lane & Tom Prichard) defeated Robert Gibson & Tim Horner. July 14, 1992 – SMW TV: The Heavenly Bodies (Stan Lane & Tom Prichard) defeated Joey Maggs & Rick Cannon to retain the tag team titles. July 17, 1992 – SMW: The Heavenly Bodies (Stan Lane & Tom Prichard) defeated The Fantastics (Bobby Fulton & Jackie Fulton) in a street fight to retain the tag team titles. July 30, 1992 – SMW TV: The Heavenly Bodies (Stan Lane & Tom Prichard) defeated Ben Jordan & Hector Guerrero to retain the tag team titles. August 8, 1992 – SMW: The Fantastics (Bobby Fulton & Jackie Fulton) defeated The Heavenly Bodies (Stan Lane & Tom Prichard) in a steel cage match to win the tag team titles. August 14, 1992 – SMW TV: The Stud Stable (Jimmy Golden & Robert Fuller) defeated The Fantastics (Bobby Fulton & Jackie Fulton) and Danny Davis & Dixie Dynamite and The Heavenly Bodies (Stan Lane & Tom Prichard) in a 4-way tag team elimination match. August 21, 1992 – SMW TV: The Heavenly Bodies (Stan Lane & Tom Prichard) defeated Danny Davis & Tommy Angel. September 5, 1992 – SMW TV: The Heavenly Bodies (Stan Lane & Tom Prichard) defeated The Fantastics (Bobby Fulton & Jackie Fulton) in a no disqualification match to win the tag team titles. November 13, 1992 – SMW: The Rock ‘n’ Roll Express (Ricky Morton & Robert Gibson) defeated The Heavenly Bodies (Stan Lane & Tom Prichard) in a hospital elimination match to win the tag team titles. November 26, 1992 – SMW: The Heavenly Bodies (Stan Lane & Tom Prichard) defeated The Rock ‘n’ Roll Express (Ricky Morton & Robert Gibson) in a falls count anywhere match to win the tag team titles. November 27, 1992 – SMW: The Rock ‘n’ Roll Express (Ricky Morton & Robert Gibson) defeated The Heavenly Bodies (Stan Lane & Tom Prichard) in a Texas Death match to win the tag team titles. November 28, 1992 – SMW: The Heavenly Bodies (Stan Lane & Tom Prichard) defeated The Rock ‘n’ Roll Express (Ricky Morton & Robert Gibson) in a street fight to win the tag team titles. November 29, 1992 – SMW: The Rock ‘n’ Roll Express (Ricky Morton & Robert Gibson) defeated The Heavenly Bodies (Stan Lane & Tom Prichard) in a steel cage match to win the tag team titles. December 12, 1992 – SMW TV: The Heavenly Bodies (Stan Lane & Tom Prichard) defeated Daniel Little Bear & Reno Riggins. December 19, 1992 – SMW TV: The Rock ‘n’ Roll Express (Ricky Morton & Robert Gibson) defeated The Heavenly Bodies (Stan Lane & Tom Prichard). December 25-27, 1992 – SMW: The Rock ‘n’ Roll Express (Ricky Morton & Robert Gibson) defeated Jim Cornette & The Heavenly Bodies (Stan Lane & Tom Prichard) in a handicap match. January 18, 1993 – SMW TV: The Heavenly Bodies (Stan Lane & Tom Prichard) defeated The Rock ‘n’ Roll Express (Ricky Morton & Robert Gibson) to win the tag team titles. February 6, 1993 – WCW Saturday Night: The Rock ‘n’ Roll Express (Ricky Morton & Robert Gibson) defeated The Heavenly Bodies (Stan Lane & Tom Prichard) by disqualification to retain the SMW tag team titles. February 21, 1993 – WCW SuperBrawl III: The Rock ‘n’ Roll Express (Ricky Morton & Robert Gibson) defeated The Heavenly Bodies (Stan Lane & Tom Prichard) by disqualification. The Heavenly Bodies retains the SMW tag titles. February 27, 1993 – WCW Worldwide: Ricky Steamboat, Shane Douglas & The Rock ‘n’ Roll Express (Ricky Morton & Robert Gibson) vs. The Heavenly Bodies (Stan Lane & Tom Prichard) & The Hollywood Blondes (Flyin’ Brian & Stunning Steve) ended in a doubled disqualification. April 2, 1993 – SMW: The Heavenly Bodies (Stan Lane & Tom Prichard) defeated Arn Anderson & Dutch Mantel and The Rock ‘n’ Roll Express (Ricky Morton & Robert Gibson) in a 3-way tag team street fight. May 1, 1993 – SMW TV: The Heavenly Bodies (Stan Lane & Tom Prichard) defeated Bobby Blaze & Robbie Eagle. May 9, 1993 – SMW: Brian Lee, The Stud Stable (Jimmy Golden & Robert Fuller) & The Rock ‘n’ Roll Express (Ricky Morton & Robert Gibson) defeated Kevin Sullivan, Killer Kyle, The Heavenly Bodies (Stan Lane & Tom Prichard) & The Tazmaniac in a cage match. May 15, 1993 – SMW: The Rock ‘n’ Roll Express (Ricky Morton & Robert Gibson) defeated The Heavenly Bodies (Stan Lane & Tom Prichard) in a looser leaves SMW match to win the tag team titles. 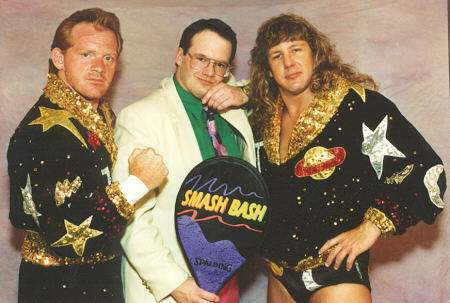 May 22, 1993 – SMW TV: The Heavenly Bodies (Jimmy del Ray & Tom Prichard) defeated Bobby Blaze & Mike Samson. June 5, 1993 – SMW TV: The Heavenly Bodies (Jimmy del Ray & Tom Prichard) defeated Mike Samson & Robbie Eagle. July 31, 1993 – SMW TV: The Heavenly Bodies (Jimmy del Ray & Tom Prichard) defeated Chris Comet & Larry Santo. August 9, 1993 – RAW: The Heavenly Bodies defeated Bobby Who and Mike Bucci (aka Nova). August 14, 1993 – Superstars: The Heavenly Bodies (Jimmy del Ray & Tom Prichard) defeated Bert Centeno & Rich Myers. August 14, 1993 – SMW: The Armstrongs (Bob Armstrong, Scott Armstrong & Steve Armstrong) & The Rock ‘n’ Roll Express (Ricky Morton & Robert Gibson) defeated Jim Cornette, The Bruise Brothers (Don Harris & Ron Harris) & The Heavenly Bodies (Jimmy del Ray & Tom Prichard) in a cage match. August 20, 1993 – SMW: The Bruise Brothers (Don Harris & Ron Harris) defeated The Armstrongs (Scott Armstrong & Steve Armstrong) and The Heavenly Bodies (Jimmy del Ray & Tom Prichard) and The Rock ‘n’ Roll Express (Ricky Morton & Robert Gibson) in a 4-way tag team elimination match. August 22, 1993 – Wrestling Challenge: The Heavenly Bodies (Jimmy del Ray & Tom Prichard) defeated Curt Sloan & Darren Trujillo. August 27, 1993 – SMW: The Rock ‘n’ Roll Express (Ricky Morton & Robert Gibson), Scott Armstrong & Steve Armstrong defeated The Heavenly Bodies (Jimmy del Ray & Tom Prichard) & The Bruise Brothers (Don Harris & Ron Harris) in a tag team elimination match. August 28, 1993 – Superstars: The Heavenly Bodies (Jimmy del Ray & Tom Prichard) defeated Jason Headings & Tony Roy. August 30, 1993 – SummerSlam: The Steiner Brothers defeated The Heavenly Bodies w/Jim Cornette to retain the Tag titles. October 2, 1993 – Superstars: The Heavenly Bodies (Jimmy del Ray & Tom Prichard) defeated John Paul & Reno Riggins. October 2, 1993 – SMW TV: The Heavenly Bodies (Jimmy del Ray & Tom Prichard) defeated Chris Kanyon & Jason West. October 4, 1993 – RAW: The Heavenly Bodies defeated Mark Taylor and Scott Thomas. October 17, 1993 – Wrestling Challenge: The Heavenly Bodies (Jimmy del Ray & Tom Prichard) defeated Ray Roy & Tim McNeany. October 30, 1993 – Superstars: The Heavenly Bodies (Jimmy del Ray & Tom Prichard) defeated Mark Thomas & PJ Walker. November 6, 1993 – SMW TV: The Heavenly Bodies (Jimmy del Ray & Tom Prichard) defeated Chris Comet & Chris Kanyon. November 24, 1993 – Survivor Series: The Heavenly Bodies (Jimmy del Ray & Tom Prichard) defeated The Rock ‘n’ Roll Express (Ricky Morton & Robert Gibson) to win the SMW tag team titles. November 20, 1993 – SMW TV: The Heavenly Bodies (Jimmy del Ray & Tom Prichard) defeated The Bruise Brothers (Don Harris & Ron Harris) by DQ. November 27, 1993 – SMW TV: The Rock ‘n’ Roll Express (Ricky Morton & Robert Gibson) & Tracy Smothers defeated Brian Lee & The Heavenly Bodies (Jimmy del Ray & Tom Prichard) by disqualification in a 4-way tag team match. January 15, 1994 – SMW TV: The Heavenly Bodies (Jimmy del Ray & Tom Prichard) defeated Jason Herd & Jason West. February 5, 1994 – SMW TV: The Heavenly Bodies (Jimmy del Ray & Tom Prichard) defeated The Rock ‘n’ Roll Express (Ricky Morton & Robert Gibson) by disqualification. February 26, 1994 – SMW TV: Bobby Blaze & The Rock ‘n’ Roll Express (Ricky Morton & Robert Gibson) defeated Killer Kyle & The Heavenly Bodies (Jimmy del Ray & Tom Prichard). March 20, 1994 – WrestleMania X: The Heavenly Bodies (Jimmy del Ray & Tom Prichard) defeated The Bushwhackers (Butch & Luke) in a dark match. April 1, 1994 – SMW: The Rock ‘n’ Roll Express (Ricky Morton & Robert Gibson) defeated The Heavenly Bodies (Jimmy del Ray & Tom Prichard) in a looser leaves town match to win the tag team titles. April 3, 1994 – Wrestling Challenge: The Heavenly Bodies (Jimmy del Ray & Tom Prichard) defeated John Chrystal & PJ Walker. April 17, 1994 – Wrestling Challenge: The Heavenly Bodies (Jimmy del Ray & Tom Prichard) defeated Derek Domino & Mike Maraldo. April 25, 1994 – RAW: The Heavenly Bodies defeated John Paul and Jason Headings. April 30, 1994 – Superstars: The Heavenly Bodies (Jimmy del Ray & Tom Prichard) defeated Mike Khoury & PJ Walker. May 8, 1994 – Wrestling Challenge: The Heavenly Bodies (Jimmy del Ray & Tom Prichard) defeated The Bushwhackers (Butch & Luke). May 28, 1994 – Superstars: The Heavenly Bodies (Jimmy del Ray & Tom Prichard) defeated Mike Davis & Phil Apollo. June 5, 1994 – Wrestling Challenge: The Heavenly Bodies (Jimmy del Ray & Tom Prichard) defeated Mike Bell & Virgil. June 20, 1994 – RAW: The Heavenly Bodies defeated Jim Powers and Russ Greenberg. August 5, 1994 – SMW: The Thrillseekers (Chris Jericho & Lance Storm) defeated The Heavenly Bodies (Jimmy del Ray & Tom Prichard) in a street fight. August 21, 1994 – Wrestling Challenge: The Heavenly Bodies (Jimmy del Ray & Tom Prichard) defeated Butch Banks & Sonny Rogers. August 27, 1994 – SMW TV: The Rock ‘n’ Roll Express (Ricky Morton & Robert Gibson) defeated The Heavenly Bodies (Jimmy del Ray & Tom Prichard) to retain the tag team titles. September 3, 1994 – Superstars: The Heavenly Bodies (Jimmy del Ray & Tom Prichard) vs. The Smoking Gunns (Bart Gunn & Billy Gunn) ended in a no contest. September 11, 1994 – Wrestling Challenge: The Heavenly Bodies (Jimmy del Ray & Tom Prichard) defeated Paul Van Dale & Tony Roy. September 19, 1994 – RAW: The Heavenly Bodies defeated Mike Bell and Steve King. September 25, 1994 – Wrestling Challenge: The Heavenly Bodies (Jimmy del Ray & Tom Prichard) defeated Butler Stevens & Todd Becker. October 17, 1994 – RAW: The Heavenly Bodies defeated Nick Barberry and Barry Horowitz. October 23, 1994 – Wrestling Challenge: The Heavenly Bodies (Jimmy del Ray & Tom Prichard) defeated Gary Scott & Rich Myers. November 6, 1994 – Wrestling Challenge: The Heavenly Bodies (Jimmy del Ray & Tom Prichard) defeated Ben Jordan & Tony Roy. November 23, 1994 – Survivor Series: The Million Dollar Team (Bam Bam Bigelow, Jimmy del Ray, King Kong Bundy, Tatanka & Tom Prichard) defeated Guts And Glory (Adam Bomb, Bart Gunn, Billy Gunn, Lex Luger & Mabel) in a tag team elimination match. November 26, 1994 – Superstars: The Heavenly Bodies (Jimmy del Ray & Tom Prichard) defeated ??? & Tyrone Knox. November 28, 1994 – RAW: The Heavenly Bodies defeated Gary Scott and Buck Quartermaine. December 18, 1994 – Wrestling Challenge: The Heavenly Bodies (Jimmy del Ray & Tom Prichard) defeated JS Storm & Ray Raymond. December 26, 1994 – Superstars: The Heavenly Bodies (Jimmy del Ray & Tom Prichard) defeated The Bushwhackers (Butch & Luke) in the quarter-finals. January 14, 1995 – Superstars: Bob Holly & The 1-2-3 Kid defeated The Heavenly Bodies (Jimmy del Ray & Tom Prichard) in the semi-finals of the world tag team titles tournament. January 16, 1995 – RAW: The 1-2-3 Kid and Bob Holly defeated The Heavenly Bodies. January 22, 1995 – Wrestling Challenge: The Heavenly Bodies (Jimmy del Ray & Tom Prichard) defeated Bob Knight & Cory Student. February 11, 1995 – Superstars: The Heavenly Bodies (Jimmy del Ray & Tom Prichard) defeated Buck Quartermain & Raven Clark. February 19, 1995 – Wrestling Challenge: The Heavenly Bodies (Jimmy del Ray & Tom Prichard) defeated ??? & Bill Weaver. March 19, 1995 – Wrestling Challenge: The Heavenly Bodies (Jimmy del Ray & Tom Prichard) defeated Larry Santo & Todd Morton. April 30, 1995 – Wrestling Challenge: The Heavenly Bodies (Jimmy del Ray & Tom Prichard) defeated Jerry Lynn & Lenny Carlson. July 21, 1995 – PCW: The Heavenly Bodies (Jimmy del Ray & Tom Prichard) defeated Assault And Battery (Jimmy Deo & Maxx Crimson) to win the tag team titles. July 22, 1995 – PCW: Assault And Battery (Jimmy Deo & Maxx Crimson) defeated The Heavenly Bodies (Jimmy del Ray & Tom Prichard) to win the tag team titles. August 4, 1995 – SMW: The Heavenly Bodies (Jimmy del Ray & Tom Prichard) defeated Dirty White Boy & Tracy Smothers to win the tag team titles. August 7, 1995 – USWA: The Heavenly Bodies (Jimmy del Ray & Tom Prichard) defeated PG-13 (JC Ice & Wolfie D) to win the tag team titles. September 16, 1995 – SMW TV: The Heavenly Bodies (Jimmy del Ray & Tom Prichard) defeated Chris Michaels & Ron Davis. September 23, 1995 – SMW TV: The Heavenly Bodies (Jimmy del Ray & Tom Prichard) defeated Chris Michaels & Robert Gibson by disqualification to retain the tag team titles. October 7, 1995 – SMW TV: The Heavenly Bodies (Jimmy del Ray & Tom Prichard) defeated The THUGs (Dirty White Boy & Tracy Smothers) to retain the tag team titles. October 28, 1995 – SMW TV: The Heavenly Bodies (Jimmy del Ray & Tom Prichard) defeated Chris Michaels & The Wolfman. November 23, 1995 – SMW: Robert Gibson & The Heavenly Bodies (Jimmy del Ray & Tom Prichard) defeated Dirty White Boy, Ricky Morton & Tracy Smothers by disqualification. November 25, 1995 – SMW TV: Robert Gibson & The Heavenly Bodies (Jimmy del Ray & Tom Prichard) defeated Brad Armstrong & The THUGs (Dirty White Boy & Tracy Smothers). December 9, 1995 – ECW December to Dismember: The Public Enemy (Johnny Grunge & Rocco Rock) defeated The Heavenly Bodies (Jimmy del Ray & Tom Prichard).